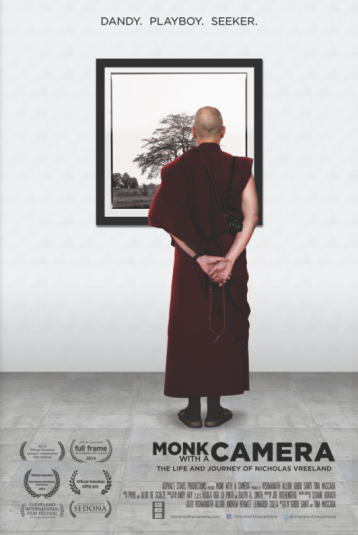 MONK WITH A CAMERA chronicles the life and spiritual quest of Nicholas (Nicky) Vreeland, who for the past twenty-eight years has been a Tibetan Buddhist monk. The son of a United States Ambassador, grandson of legendary Vogue editor Diana Vreeland, and a photographer by trade, Nicky left his privileged life behind to follow his true calling. He moved to India, cutting his ties with society, photography, and his pleasure-filled world, to live in a monastery with no running water or electricity. There he would spend the next 14 years studying to become a monk. Then in one of life's beautiful twists, Nicky went back to the worldly pursuit of photography in order to help his fellow monks rebuild their monastery, one of the most important of the Tibetan Buddhist tradition. His journey from being a photographer to becoming a monk and, most recently, to being appointed as the abbot of the monastery he helped to rebuild, are the core of the story. "(An) attractive mix of retro celebrity and spiritual appeal."